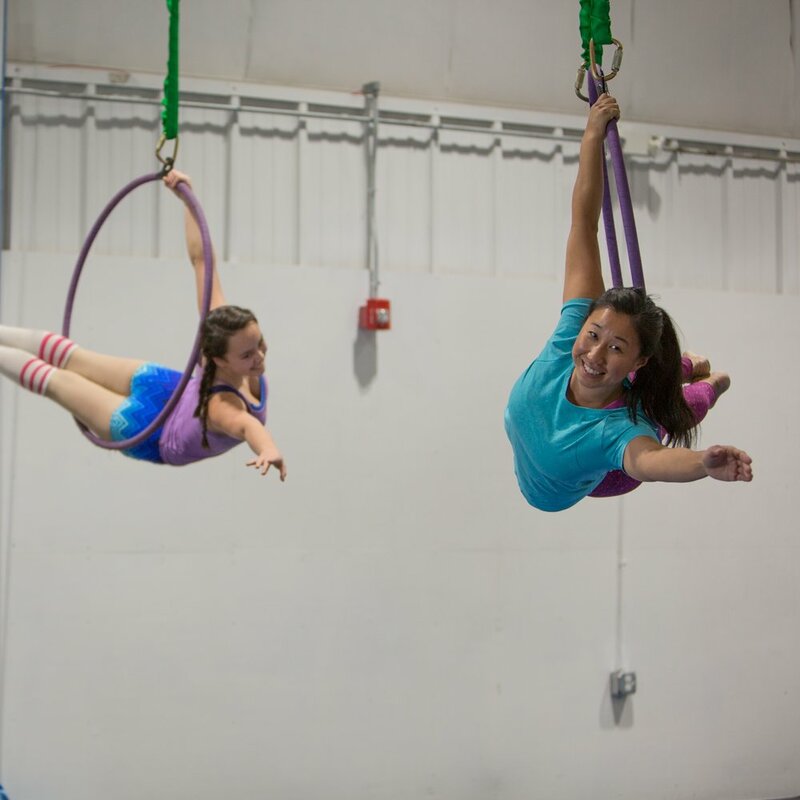 The aerial hoop (or lyra) is a relative of the trapeze. It is a steel circle apparatus that is suspended from the ceiling either from one or two ropes with a swivel so it has the ability to spin! Think of it like a big circular swing! Hoop students will swing, spin, and learn hoop vocabulary such as poses and movements under, in, and above the hoop while being right-side-up and up-side-down. All hoop classes will incorporate lessons for strength, creativity, and coordination, as well as injury prevention. Level 2: Students must be able to get up to sitting in the hoop without help. They must be able to do a pull-over to hip hang from the ground without help. Students must possess confidence in executing standing poses and movements on top of the hoop. Level 3: Students must be able to invert without help multiple times throughout class. They must be familiar with a range of skills on the hoop including single knee hang, front balance, back balance, half mill circles, and skills on top of the hoop. Students should be working on knee hang and long hang beats, though execution does not need to be perfect for entrance to Level 3. Level 4: Students must be able to invert without help multiple times throughout class. They must be familiar with a range of skills on the hoop including single knee hang, front balance, back balance, and skills on top of the hoop. Students should be comfortable executing beats to pull over on the top of the hoop, Russian rolls, and mill circles. Students should feel comfortable with long beats, pike beats, and knee beats.